Forward Plate Rental – Stone SFA3500, available for rent from the Duke Company in Rochester NY, Ithaca NY and the entire Western New York Region. 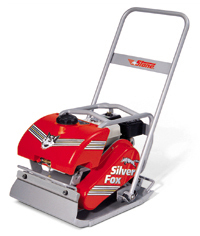 Designed for asphalt patching and finishing application. 20″ wide x 24″ long, creating 3500 pounds of centrifugal force, 5200 VPM. Perfect for smaller jobs, trenches, granular soils, backfill. Asphalt Plate comes with removable water tank. Travel speed: up to 100 feet per minute.